Keiro’s new “Superstar” series will provide highlight how some of our members in the community keep themselves healthy. 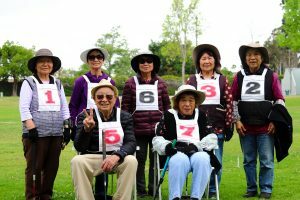 As one of the founders and the first president of the Orange County Japanese American Association, Miyake-san is still actively dedicated to serving the community. 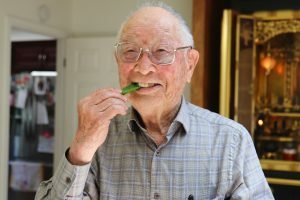 He is a Kibei Nisei who is turning 100 next summer. He moved back to Japan at age four and grew up in Hiroshima. After graduating agricultural school at age 18, his father recommended that he visit the country where he was born. 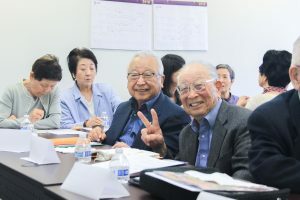 “From the second I arrived, I fell in love with the United States and never wanted to return back to Japan,” he recalls. 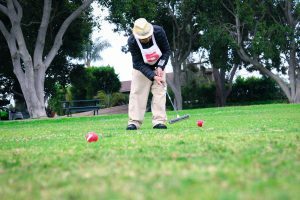 Other than healthy eating and exercise, he stresses the importance of being active in the community. He says, “Harmony and collaboration is important. If you immerse yourself in the community, you feel refreshed, you will move around so it’ll be good exercise, and you learn good things from others.” He recalls that his father urged him to be involved in his community. Before he left Hiroshima, his father told him, “Akemi, make sure you give back. When I was in America, I only thought about making money for the family and returning to Japan. And I was wrong. Make sure you contribute to the community.” Ever since then Miyake-san has kept his promise to his father.